← No (digital) place like home? A few years ago I came across Iain Scott – well it was a bit hard to miss him as his kilt and hair meant you had to wear sunglasses to be in the same room – as part of the External Advisory Group on the National Review of Town Centres (the Fraser Review). We have discussed and debated town centres generally and entrepreneurship in town centres at odd occasions over the period since, and were involved together on the fringes of the Start-Up Street programme in Stirling, of which Made in Stirling was a part. I have subsequently presented as part of his Scottish Government funded Can Do Towns programme. It is entirely appropriate therefore that Iain accepted an invitation this week to be the latest in my summer series of guest bloggers. The trigger event is the launch of the first Can Do Messy Space in Falkirk this Thursday. Long term readers of this blog may recall a post about the old Woolworth store in Asheville, North Carolina and the other dynamic re-use of vacant space in that town. This Can Do Messy Space in Falkirk is not the same – no such re-uses can really be identical – but it shares the same DNA of getting people and makers back in to town centres and reinventing new uses for old spaces. So what is Can Do Towns and what is Can Do Messy Space in Falkirk all about? “Town centre regeneration or town centre reinvention? For any enterprising person or community the answer has to be town centre reinvention. It’s a phrase filled with opportunity and also love which is perhaps why the Can Do Towns “Vacant To Vibrant “ project has captured the imagination of so many people across Scotland’s towns. Can Do Towns came out of two strategies from the Scottish Government. The first being the Can Do Enterprise and Innovation Framework and the second the Town Centre Action plan. The thinking was simple – enterprising people built our towns and only enterprising people can save them. In the rush to regenerate our town centres, the aspect of local enterprise is all too often forgotten about. But we need to nurture entrepreneurship to help bring about the regeneration that some of our high streets so desperately need. Can Do Towns is a programme that seeks to address exactly that challenge by helping people who are passionate about their communities to bring currently unloved and disused spaces back to life, and in the process encourage greater vibrancy in their town centres. In May 2015 we asked Development Trusts, Business Improvement Districts and community groups if they wanted to test their enterprise potential. Our aim was simple: to find a redundant building and breathe new life into it without any funding. The plan was also to create a ‘messy space’- a place where people could share, collaborate and work together. This was not to be an Innovation hub or a Creative Hub, but a mash up of all kinds of enterprise ideas and enterprising people in a ‘Can Do’ space. I wanted this Can Do Hub to tap into latent skills and potential in order to produce a new breed of grassroots entrepreneur, intent on re-inventing their town. For too long, we have been looking to the past to solve current day problems and revitalise our town centres. We now live and work and shop in completely different ways. What has been missing is the realisation that Scotland’s town centres and empty buildings are amazing places and that we need to combine these resources with the amazing people living nearby. On 27th August Margaret Burgess the Housing Minister opens our very first Can Do Messy Space and turns the project from virtual to actual. Falkirk is to be a pilot scheme to show other towns how this hub concept can be successful. 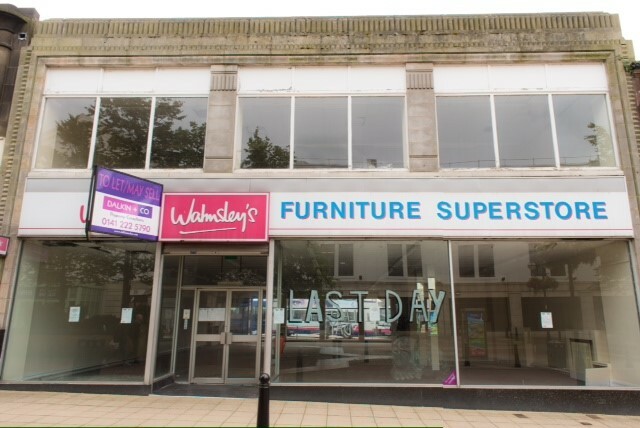 The former Walmsley’s Store on Falkirk’s Callendar Riggs is being turned into the first CanDoTowns Hub where local people will work together, test out enterprising ideas, and sell and make wares. The key factor here is that the project aims to keep as much of the money generated within the Falkirk economy. Another difference from other regeneration projects is that this one will bring together not-for-profit, public, voluntary and private sector organisations all under one roof in a unique collaboration. If our assumptions are right, then the building could host businesses with a collective turnover of £3 million. If we then use the local economy multiplier, we can predict it will help retain £9 million in the Falkirk area. 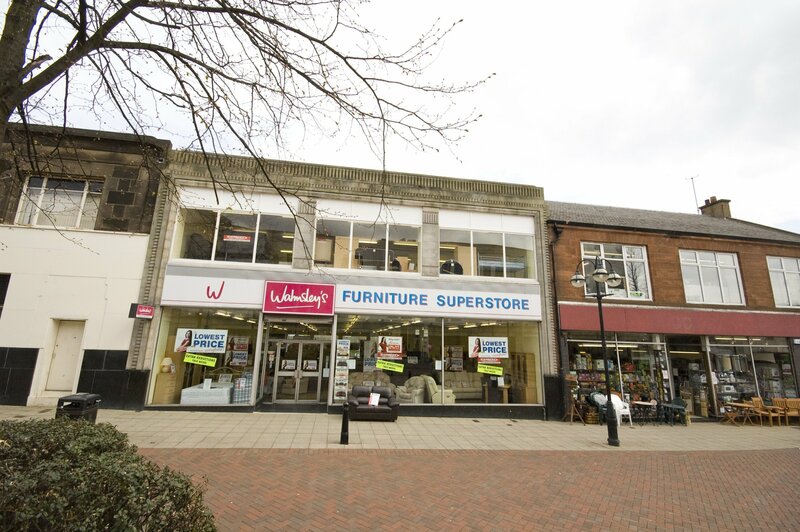 The Walmsley’s store site when it was trading. Copyright: Local Data Company, reproduced with permission. More can be found on www.candotowns.org and on twitter @candotowns and currently there is a clip of Iain discussing Can Do Towns on Good Morning Scotland 24th August available here. This entry was posted in Can Do Towns, Entrepreneurship, Falkirk, Regeneration, Reinvention, Scotland's Town and High Streets, Town Centre Review, Town Centres, Vacancies, Vibrancy and tagged Can Do Towns, Entrepreneurship, Falkirk, Opportunity, Re-invention, Scottish Government, Town Centre Review, Town Centres, Vacancy. Bookmark the permalink. A great idea and I am looking forward to Thursday.There are a few projects similar also worth a mention, Starting Point in Airdrie is focussed on the retail sector and recently moved to new premises having helped several new businesses develop and move in to empty premises. There is also Imagine (previously Coast) in Banff in Aberdeenshire, where local designers and crafters can display and sell their goods, with a social enterprise aspect, and in Peterhead Peterhead Projects who have given over space in their shop to local crafters to sell their items at a low rental. I look forward to new ideas and development of old one’s.